Blue is the new silver | What Car? 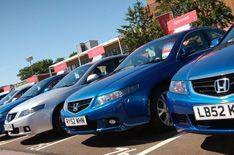 Blue is now the most popular colour for used cars, according to the auction house BCAs annual Used Car Market Report. BCA found that blue cars are more popular on the used market, but only just. Shades of blue accounted for 23.4% of used cars, with silver just behind with 23.3%. Red was a distant third, accounting for 12.6% of the market. However, the report suggests that colour is not a crucial factor for used car buyers when making a decision. Just 8% of those surveyed rated colour as important, compared with 54% ranking price as vital. Make and model (42%) and low mileage (34%) were the next most crucial factors. BCAs UK operations director, Simon Henstock, said: As used car buyers cannot specify the colour they want, they choose the best combination of model, specification, age, mileage and condition for their budget and get the most attractive colour they can. The message for new car buyers is choose a colour scheme that will attract buyers when you come to sell the car, rather than one which will only have a limited appeal.